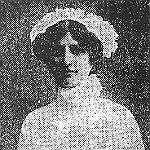 AN account of a Landore lady who became a nurse in Serbia in 1915 is part of a new exhibition in Swansea all about the role of women in the First World War. The story of Elizabeth Clements, who was captured by the Austrians and underwent a difficult captivity, is among those included at the city’s Central Library throughout September. Also included is a display of newspaper articles and photos that show Swansea women in new wartime a century ago. Some of the jobs women undertook on the home front included tinplate work, window cleaning, chauffeuring and farming. There was an even a football game between the women of Swansea and Cardiff. Swansea Council is behind the exhibition. Other features include the story of a Swansea woman teacher who escaped a sinking ship struck by a mine and the sad recollection of the Swansea women who died in accidents at a munitions factory in Pembrey just outside Llanelli. Professor Deirdre Beddoe will at Central Library on Saturday September 6 to give a talk at 2pm that will focus on the female munitions workers of World War One. Steve Hardman, Swansea Council’s Library Services Manager, said: “A number of events and talks have already been held at Central Library so far this year and that will continue to be the case right up until 2018 as we mark a century since World War One. “The role of women in these historic conflicts often goes unnoticed but this new exhibition shines a light on the hardships and torment many Swansea women endured 100 years ago. An exhibition all about Swansea and World War One is also ongoing at Swansea Museum until January 18 and a series of war-related movies are being shown at the historic attraction over coming months. They include Gallipoli on Sunday September 7 at 2pm, Private Peaceful on September 21 at 2pm and A Farewell to Arms on October 5 at 2pm.